Tucked away in a corner, and built within one of the oldest buildings in Al Quoz, using recyclable materials, the newly opened Cassette is a modern Parisian bistro with an old town, cobblestone feel. The menu offers a wide range of options from healthy as well as indulgent. dishes. Since my visit took place in the morning, I chose poached eggs with smoked salmon on a bed of sliced avocados. The menu also includes an omelette full of greens, French toast, artisanal coffees coffee (which would make for killer Instagram shots), a range of wellness teas, both hot and iced, and a variety of homemade juices and seasonal drinks. Make sure you try their homemade almond croissant. Cassette is also home to an interactive corner full of classic and limited edition vinyl records that you can play on their in-house record player. Music is a big deal here, they even curate their own playlists, so the music fits just right with this comfortable hipster cool venue. Angelina has recently updated its menu specials. Head down for breakfast and try their famous Shakshuka, made with their special homemade tomato sauce topped with crumbles of feta cheese, with a touch of green herbs and served with crispy sliced bread. They also have a selection of French pastries and instagrammable coffees. One of Dubai’s hidden cafe gems, Boston Lane. Owned by Australian expats and inspired by Melbourne's laneway coffee culture, Boston Lane is tucked away in the Courtyard, Al Quoz and boasts classic-corner shop favourites like brioche “Breaky” rolls, cheese and garlic toasties and a range of wholesome bowls and with the launch of five new concepts within The Collective space, we can’t think of a better way to spend a Saturday. Society Cafe is a very Instagram-friendly cafe located in Jumeirah 1 with a high quality selection of breakfast, lunch and dinner meals. Their breakfast is of course the more popular option. On the menu you will find includes bowls that are both sweet (Acaii) and savoury (egg bowls). Other popular breakfast items include the Turkish eggs, French toast and the buttermilk pancakes. Flow has an on-trend menu featuring quality ingredients to cater for healthy lifestyles. Whether you’re an early bird hoping to catch the worm after a midweek gym session, or you struggle to roll out of bed before 11am on a weekend, Flow’s breakfast menu is available all day. The menu includes organic Eggs Benedict, Shakshuka, speciality coffee, smoothies and juices are available at any time of the day. Items on the menu include Vegetable Egg White Omelette, Secret Seeded French Toast, Egg Arlington. Levee brings it back to basics with a new menu that celebrates good honest food. Their offering includes tasty Mediterranean cuisine, instagrammable dishes and a calming beachside scenery. The floor to ceiling windows and marble Dishes include some good old French toast, shakshuka eggs, eggs benedict, quinoa salad, flat bread. Finish your breakfast off with pastries and some coffee. Choose from a assorted menu of 17 real deal, old-school dishes like the Divorced Eggs with crispy yellow corn tostadas, poached eggs, salsa verde and roja or try the Potato & Leek Latkes, topped with smoked salmon, sour cream and fish roe. If you’re craving something sweet, Kizmet is about to change the game of Carrot Cakes featuring the Carrot Cake Granola with coconut sorbet and carrot milk. A unique breakfast selection in a calm environment at the heart of the city. Get your caffeine kick from the free, bottomless freshly brewed black coffee available until 4pm, so you can have as many cups as you need. Location Dubai Opera Timings Every Friday and Saturday from 10AM-2PM. Bottomless, self-service coffee until 4pm Upstairs only. BB Social Dining has just launched a new a la carte breakfast menu, where delicious dishes start at Dh30 for a rainbow stack of four pancakes, and Dh35 for a four cheese and spinach pretzel. Head over there on your weekend mornings and try some of their dishes to start your day off beautifully. Huqqa and The Market have put together a huge breakfast menu made of authentic Turkish breakfast dishes. The breakfast is made up of all the traditional favourites and a few surprises including eggs, Turkish cheeses, olives, fruits, nuts as well as the famous Simit and Anatolian fatayer. A minimum of two people can enjoy the breakfast spread. Perfect for breakfast, a midday snack, lunch or dinner, the all-day dining menu offers all kinds of dishes. Their new menu includes imaginative creations like the spicy buffalo fried chicken tacos drizzled with umami blue-cheese dressing as well as fillet mignon and lobster Bearnaise, Spanish style garlic shrimp, and a smoked salmon bagel sandwich just to name a few. This cosy hangout Izu Brasserie & Bakery, located inside Le BHV Marais at City Walk is the perfect place to meet up with friends for a leisurely breakfast and coffee. Their tartines, scrambled eggs and pancakes are the standout breakfast dishes. The rustic vibes and the artisnial food make this place a special one. Named after the Lighthouse of Alexandria, The Lighthouse is a subtle nod to Virginia Woolf and members of the Bloomsbury set who gathered for conversation, good food and company. The menu, created by Executive Chef Izu Ani, focuses on innovative Mediterranean-inspired dishes prepared from fresh, organic and seasonal produce with in a relaxed environment – whether that’s indoors in the restaurant space or al fresco in the terrace. The menu includes classic dishes like the Eggs Benedict, Spicy Shakshouka and Scrambled Eggs with Truffle to name a few. A great setting for breakfast with views of the golf course greens and vistas of Dubai’s cityscape, Hillhouse Brasserie’s expansive terrace makes for a nice setting to enjoy an al fresco meal during the cooler winter months. The Boulangerie offerings include pastries, breads, omelettes, pancakes, waffles, egg dishes, fruit and a wide selection of breakfast items served on toast, such as veal bacon and eggs, veal sausage, or salmon and cream cheese, all served from 7am to 11:30am every day. The American, all day dining restaurant and bakery, offers some of the best breakfast in town. Eggs, pancakes and of course fried chicken and waffles. They also have homemade pies for all occasions. Cult New York burger joint Black Tap, at the Jumeirah Al Naseem hotel, offers breakfast. Black Tap now offers eggs, pancakes, sandwiches and baked goods on top of its burger stacks and wild shakes. Served with Black Tap’s familiar style and a touch of swag, they also offer chorizo breakfast tacos made with scrambled eggs, special chicken chorizo, smokey chipotle mayo, avocado cream, pico de gallo, spring onion, and cilantro. The crispy chicken waffles will keep you going until dinnertime, with a sweet and savoury union of blueberry waffles and fried chicken breast, drenched in honey butter and smokey maple syrup. Eggs Benedict with slow roast beef might be your midday meal of choice, or maybe some butter milk pancakes stuffed with orange, cranberry and ricotta and sweet cream cheese spread? 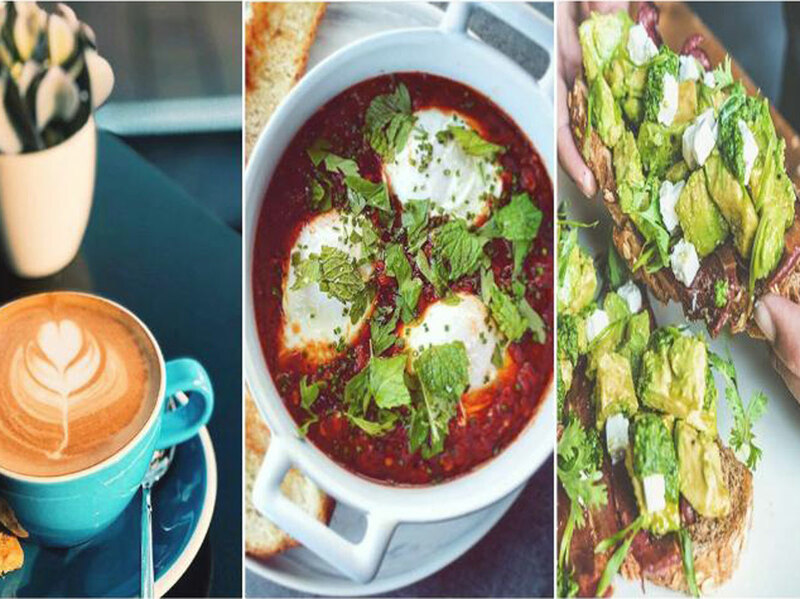 No Dubai breakfast menu would be complete without avocado on toast, and Black Tap’s take on the world’s most Instagrammed breakfast doesn’t disappoint. Rustic garlic bread is slathered with a rich guacamole, a hit of smoky chipotle, eggs your way, avocado cream, marinated cherry tomatoes, and a spring mix of salad. Located on Jumeirah Beach Road and super close to the beach, 21 Grams is a urban Balkan bistro with the warmth and comfort of a family home and the smell of freshly baked pastries. A vibrant bistro space with floor to ceiling windows, 21 Grams has a gorgeous space with balcony views overlooking Umm Suqeim Park. The extensive menu, carefully executed by a Balkan head chef, includes a fresh and authentic selection including a gypsy toast with kaymak (fresh cheese) and ajvar (red bell pepper relish), grilled cevapi (sausage) with onions and red pepper, meat and cheese burek (pastry) and traditional Balkan pies — as well as chocolate hazelnut baklava and other tempting sweets. In short, 21 Grams brings honest, wholesome soul food with authentic accents from the mountains, valleys and coasts of the Balkan region. Location Jumeirah Beach Road, Park Regis Boutique Jumeirah Cost Dh100 for two people Timings Open daily from 7am-11.30pm. The brainchild of sibling entrepreneurs Shames and Mariam Al Hashemi, Roux Café is a casual restaurant serving international cuisine, with a twist. Open for breakfast, lunch and dinner, the menu features a wide variety of dishes. Specialty items such as the popular Mom’s Flat bread for breakfast and the Buffalo Mac N’ Cheese for lunch or dinner are guaranteed to satisfy your taste buds, along with a variety of healthy salads, desserts, mocktails and coffee. The healthy indulgence spot serves hearty and healthy breakfast options that bring you flavours of an endless summer (aka life in Dubai). The menu is inspired by simple ingredients and seasonal produce, including a roasted pumpkin in a pumpkin, Parmesan Spanish omelette and freshly baked ciabatta for ricotta and tomato bruschetta. The eatery also offers a selection of organic speciality coffee, flavoured cocoa, and freshly pressed organic orange, pineapple, and pomegranate juices. Spend your mornings watching the sun over the UAE seas. Location North Side, La Mer Cost Dh130 for two people Timings Breakfast is served daily from 10am to 12.30pm. Wake up with McGettigan’s at Souk Madinat on the weekend. Their breakfast, is available every Friday, Saturday and Sunday. Sit back, relax and enjoy the picturesque views of the Burj Al Arab and Souk waterways. Try their delicious banana pancakes with salted caramel sauce and fresh strawberries, or if you’re more the savoury type, then the Eggs Benedict with spinach and hollandaise sauce served on an English muffin with hash browns is for you. You could also opt for the full Irish, made in the traditional way! The food and the views make this one of our favourites here in Dubai! Chateau Blanc, a patisserie specialising in custom-made cakes and desserts, has just introduced its all-day Terrace Menu, just in time for spring. The menu includes items such as eggs Benedict and avocado on toast. Or you could try one of their new innovative breakfast dishes, like the crispy kale scramble. For lunch, try the roasted garlic shrimp with healthy quinoa, broccolini and tomatillo sauce or a Coco-Cola chicken — cola marinated chicken served with sweet potato fries and house salad. Sugar fixes are also taken care of with the a bunch of options including the soft ricotta pancakes served with wild berries and sweet vanilla ice cream, drizzled with salted caramel sauce topped with caramelised popcorn. Farzi Cafe, the funky bistro, has a breakfast menu with Indian and Arabic influences. Inspired by breakfast specialities from the two cultures, the focus here will be on fresh vegetables, super foods and protein-rich seeds, with playful twists like the Power Nut Poha with fried quail’s egg. It’s beaten rice with quinoa, flax seeds, served with chicken sausage and a fried quail egg on the top. Yummy. This popular South Antolian restaurant serves up amazing eggs menemen and delicious breads. The food is packed with flavours and it is the perfect place to gather the family. Breakfast at Kosebasi is bound to be a popular spot to enjoy during the days of the weekend. If variety is what you’re looking for, then Social House in The Dubai Mall is where you want to be. Its brand new breakfast menu covers everything from avocado tartine to shakshouka and the New York bagel. And what’s more, breakfast is served until 2pm. Late risers, are you listening? In addition to opening its seventh restaurant in the UAE at Dubai’s Marina Mall, Wagamama is introducing its breakfast menu to the Middle East for the first time. Dishes include an okonomiyaki, a Japanese-inspired omelette, as well as favourites such as eggs Benedict, avocado on toast, English breakfast, and apple and goji berry pancakes. They also serve breakfast for children with dishes including mini egg on toast, mini pancakes and mini English breakfast, so there is something for the entire family. Breakfast will be available daily exclusively at Marina Mall, and only on weekends in the other Wagamama restaurants. Why not have breakfast at the world’s highest restaurant, At.mosphere, Burj Khalifa? Choose from a selection of different menus including the Decadence Menu complete with continental dishes including an exotic fruit platter, French pastry selection, cold cuts and fine cheeses. The main course includes delicacies such as organic omelette, Scotch egg with ratatouille and braised lentils, as well as a savoury crepe with char siew chicken and seasonal mushrooms, waffles and brioche French toast. You could go for the a la carte option, if you don’t really feel like a full on brekkie. Location Burj Khalifa Cost Decadence Menu is Dh342 per person (UAE residents can get 35 per cent discount with their Emirates ID) and a la carte dishes start from Dh69 (A la carte available with a minimum spend of Dh200 per person) Timings Daily, from 7am to 11am (last arrival time is 10am). The cool thing about this restaurant is that it is based on the look and feel of an actual apartment, and each room cleverly depicts the surroundings of a luxury home. Check it out for breakfast and try favourites like the cold cuts, cereals and other authentic American breakfast dishes. For those who want just one plate of food, order a la carte for dishes like the classic eggs Benedict or Belgian waffles glazed with apple syrup. Arabian Tea House Restaurant & Café is located in the Bastakiya area of old Dubai and at The Mall on Jumeirah Beach Road. It is a mix of the traditional and the modern. The Deira location is in an old wind tower house, right in the heart of Dubai. Stepping into that cafe takes you back to the past. Although there has been a rapid development around Batakiya, Arabian Tea House has remained untouched and is probably one of a few places where you can take a look at the rich cultural heritage of the Emirati people. Most importantly, if you love a picturesque venue, then you'll fall in love with the vintage outdoor area and little garden. Start the day with Eggs Benedict and a freshly brewed coffee. The bistro is open daily serving breakfast, lunch and dinner and has an extensive range of pastries, cakes, specialty coffee, gourmet chocolates and ice-cream. Breakfast is served from 7am to noon daily and dishes include a range of Eggs Benedict, The Full English which consists of a choice of poached or fried eggs, veal bacon, baked beans, veal or bacon sausages, hash browns, mushrooms and toasted multi-cereal bread. Healthy options are also on offer including Avocado Toast, the Morning Booster (Acai, Chia Seed, Flax Seeds, Red Fruit Salad with Greek Yogurt and honey) and for those with a sweet tooth – French Toast and Belgian Waffles. Combining classic breakfast favourites like eggs benedict and omelettes with their 18-22 hour natural oak-wood smoked meats, sauces and sides, the all-new breakfast menu includes a variety of traditional breakfast spreads, healthy and vegetarian options, along with a generous, indulgent plate of sweet servings. Order from a selection of dishes like the crushed avo toast, an NYC brisket benedict which includes the signature brisket and Romano crusted camembert and a spin on sweet and savoury indulgence with American pancakes topped with crispy bacon and maple syrup. If you’re an early riser you can enjoy a selection of French Mediterranean breakfast offerings from 7am-1pm, every Friday and Saturday at Carine. Carine is great if you like to wake up and indulge in waffles with chocolate and Chantilly cream or have freshly baked breads with home-made jam or are on a health kick and want to enjoy a variety of eggs. RIVA Ristorante launched a partnership with the Ripe Organic, as part of their new breakfast menu. The beachside favourite has created a new menu of organic and nutritious options. Health conscious diners can raise their freshly blended smoothies to celebrate all things nutritious. Highlights include the ‘Super Berry Granola’, the ‘Riva Benedict’, a homemade spin on the well-known dish as well as the ‘Skinny Omlette’, made using bio-spinach and feta cheese. Specially tailored ‘Spirulina boosters’ and green juices are also on the menu. It also has vegan-friendly options, like the ‘Power Quinoa Salad’, and the ‘ Riva Super Bowl. The best part of this brekki, is that if you add Dh100 to your bill, you can get an all-day beach club pass. Every Saturday, they also give you the option of taking part in their Mimosa Breakfast for Dh149, which includes a breakfast item and 2 hours of unlimited orange juice and bubbly. Every Friday, Bistro Des Arts offers a great value family-friendly breakfast/brunch that actually is a brunch offering proper breakfast items like eggs, toast, French cheese and so much more. The breakfast offer includes an open buffet, a main course, a crepe and a hot beverage.